Few days back I went to SEZ tower 3 canteen for Lunch. I usually take full lunch. Now the full lunch menu is as specified in attached image (lunch_menu.jpg). (3 chapati, 1 bowl of rice etc). The chapati's I received are in the next image. (The size of chapati is around 3-3.5 inches diameter). The canteen guy explained to me that he has to give only 3 chapati's as per Menu however he is giving me ONE extra chapati. Do you see the problem ? Its the size of 'chapati'. The chapati is small. The "requirement spec" (Lunch Menu) says 3 chapatis but it does not specify the size of Chapati. 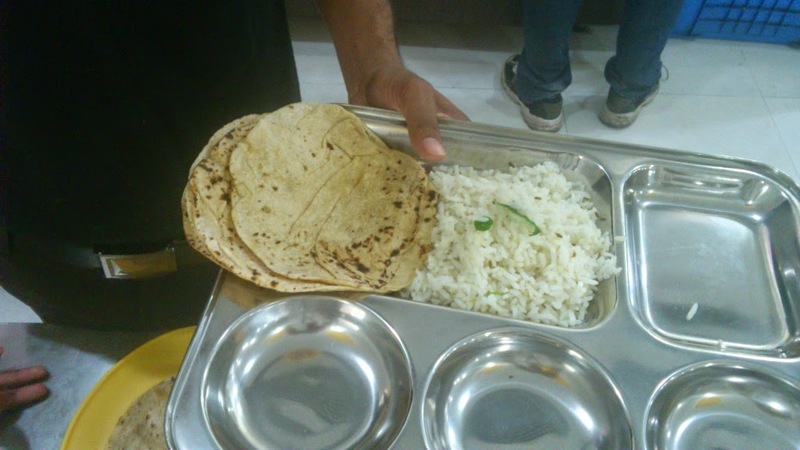 So provider can take advantage of it and serve really small chapati's and still fulfill the requirement as 'specified'. One option customer has is to provide the requirement spec is excruciating details (e.g. specify minimum size of chapati, minimum size of bowl, size of spoon for pickle etc etc). Pretty soon it will very painful to specify and it will be an "over constrained" problem. With so many restrictions, the canteen contractor has no leeway to improve or experiment. End result will be that I (i.e. customer) will not be happy with the service I get. This is a common dilemma of requirement specs. Somewhere you have to trust the "common sense" of the customer and service provider. If the service provide don't have that "common sense" then as customer you will be forced to change the provider. Remember we (software developers) are the 'service provider' for our customers. And our customers are also going to expect "common sense" from us.